One of the most unique plants to grow that no one knows about. I like it so much I planted two at my house and one at the courthouse. Numerous characteristics contribute to the attractiveness of this plant. Leaves are a dark, glossy green and are rarely bothered by pests. 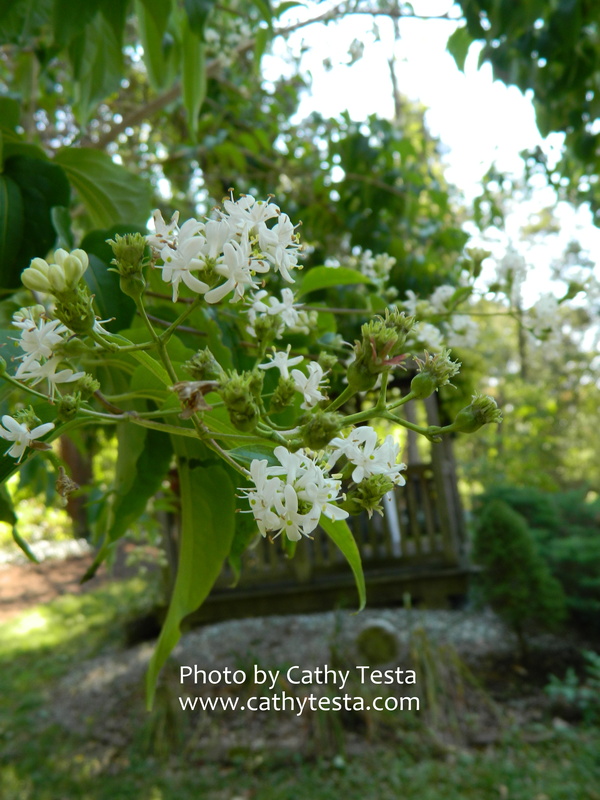 Creamy, white flowers appear in late summer when few plants are in bloom. The inflorescence is distinctive in arrangement and effect. Though each individual flower is quite small, they are borne in a panicle with six flowers tiered in a whorl with the seventh terminating the inflorescence. Panicles are born on the tips of branches. After the flowers fade, fruit appears with surrounding sepals. Color changes from green to red and persists for 2 to 3 weeks. This plant is actually more attractive in this post-bloom period than in flower. Though often grown as a large shrub, Seven-son Flower can be trained as a small tree and reach 15 to 25 feet in height. Exfoliating (peeling) bark is attractive with the inner bark being lighter. Hardy to Zone 5, seven-son flower prefers moist, well-drained soil. Remember fall is a great time to plant!